Straight from the pages of Mitzi&Co’s 2011 Calendar, Ms. Natosha hails from CA, raised in Salt Lake City, Utah. That means this Pin Up is no stranger to the slopes… In fact, she’s a Snow Bunny- an avid snowboarder of 10 years. You might remember seeing Ms. Natosha if you were at the Sacramento Autorama the last two years because she won the Pinup Contest her first year then was the host of this years contest. Then from the title, you might have guessed, Ms. Natosha is an instructor, so that explains the age old teacher/student fantasies that may pop up when you get a glimpse of her… She teaches art, but also certain ‘positions’. Read my Q&A with Natosha below while checkin’ out her photos, by Pin Up photographer Mitzi Valenzuela. When I met you, you seemed like you could be “America’s Sweetheart”! You’re such a little sweet thing! I’m curious to know if you have a dark side. What is the most trouble you’ve ever gotten into? Besides a few speeding tickets, the most trouble I have been in would have to be when I got caught throwing a huge party at my grandparents house, I was only 17 at the time, so booze and smoking were defiantly a no-no. Cops were called and my parents had to come get me at 4am. I don’t think my grandma has ever forgiven me hehe. Which classic car makes your inner ‘Bad Girl’ want to come out and play? Oh my, I have always loved a 57 Chevy Bel Air convertible in matador red with the ivory top, something about that car makes me want to go to the local make out spot. 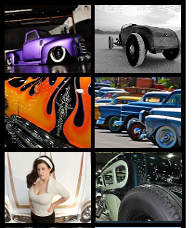 You won the Sacramento Autorama Pinup contest back in 2010. What question did you answer? Would you change your answer now if you could? My question was “tell us something about yourself most people wouldn’t guess about you?” My answer was that I’m a certified yoga instructor and a elementary art instructor. I think if I could change my answer I would have left out the art instructor part because after the pin up contest a guy came up to me and said you look like you’d be a teacher with that smile haha so I guess that’s not really a mystery. Do you consider yourself to have a good sense of humor? Is it important for a man to have a sense of humor in order to score a date with you? I’m more of a goof ball, sometimes I feel like I’m the only one who gets my jokes except for kids haha. I like a man who doesn’t take himself too seriously and who enjoys doing silly stuff like watch cartoons… I love cartoons! What is the one movie scene that gets you crackin’ up… even if it’s dumb? The scene in Ace Ventura when Jim Carrey hops out of the dolphin tank, pretending to be the trainer and he starts speaking dolphin to the reporters. I think that part is so funny. Actually, that whole movie is hilarious. My sisters and I have many inside jokes about Ace Ventura and the second Ace Ventura movie when nature calls. “ bumble bee tuna, bumble bee tuna” haha classic. Do you have any special hidden talents? Can you touch your tongue to your nose? Champion archer? or anything like that? I can’t touch my tongue to my nose but I can touch my tongue to my elbow (Promise). Oh yeah… I can almost do the splits haha. For more Ms. Natosha visit her Pinup Lifestyle Page. I really like this model – NO TATTOOS Yes!! All class no trash. Stunning woman.